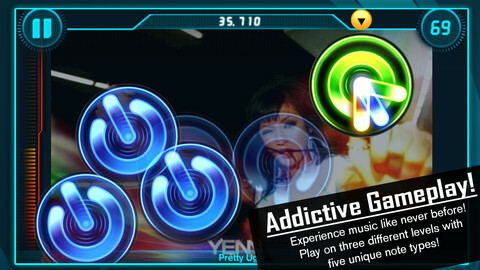 Released around the height of music gaming’s popularity, “Elite Beat Agents” may have been based around a bizarre story (save the world with the power of dance, basically), but the gameplay couldn’t have been more simple, as you tapped various buttons in time with the beat of a song, en route to victory. Impossibly addictive and incredibly unique, this game wore down my stylus to a nub and stands amongst the crowded DS library as a true highlight. Though it bears no official similarities to “EBA,” “ReRave” sports a similar concept that sees you tap circles in correct sequence to the beat of the songs. The difference is, that whereas “EBA” required a shrinking outer circle to reach the borders of your button before you could tap it, “ReRave” sees you manipulating circles that bear resemblance to the power button of many devices, and tapping them only when the line on the bottom reaches the 12 o’ clock position,until the song is done. While most are vanquished with a simple touch, some require you to hold them until they finish a bath, some require multiple taps at 1/8th beat intervals, and the dreaded double circles appear that must be completed simultaneously. Like any good rhythm game, this is a system that allows for an “easy to learn, tough to master,” philosophy, and quickly pulls you into the overall experience. A big part of this has to go to the music which may not make my playlist in everyday life (it’s a lot of club like music), but works absolutely perfectly in a gaming environment such as this, as their unique beats and paces result in creative playgrounds of rhythm based tapping that will have your fingers dancing across the screen with maniacal precision. Thankfully multiple difficulty levels allow you to adjust as needed if things get too intense, or not near intense enough. Now while it’s nice that the game features leaderboards, downloadable songs (both free and paid), and a ton of achievements, in truth if the game came with nothing but a few tracks and just the gameplay screen, I’d still be hopelessly addicted to it. This style of gameplay for a music game was flawless in “EBA,” and it maintains that untainted luster here as “ReRave” is one of the most engrossing games available in the music gaming genre, and in all of mobile gaming. Normally I’d look down on a game for borrowing so liberally from another title, but it’s about time someone brought back this style of gameplay to mobile gaming, and the team behind “ReRave” have done so with near flawless execution. When you really think about it, gaming has long been pressing a series of buttons in proper order, so it really says something that the concept has almost never been as hopelessly addictive as it has in “ReRave,” a can’t miss app of the week.